And speaking of the REAL Team Lotus... Don’t know if Y’all heard that Dario “REO Speedwagon” Franchitti fulfilled one of his life’s dreams this past week at The Speedway... As I know just how enthralled Dario is about his Hero Jimmy Clark, as I recall it being mentioned that the Flying Dutchman, a.k.a. Arie Luyendyk Sr. (working as a Spotter) gave Franchitti a pair of Jim Clark playing cards during this Month of May... As Dario had the amazing privilege of driving The Flying Scot’s 1965 Lotus 38 Ford IndyCar around The Brickyard! 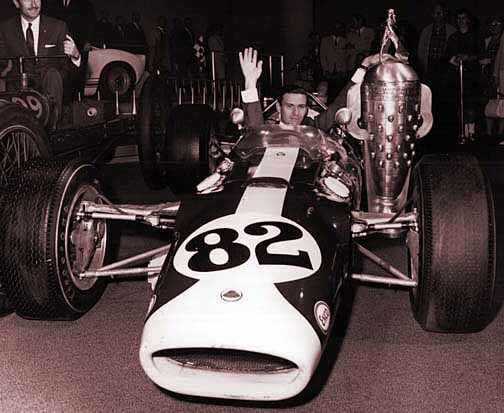 As in none other then the 1965 winning Indy 500 chassis that Clark dominated the race with and has only ever been driven by the late Messer Clark and some chap known as The Wee Scot... None other then Sir Jackie Stewart, so I’d say that Dario’s in pretty rarefied company there, eh? Now if only somebody could keep him strapped into Clark’s chassis and not unbuckle him ‘til after the Homestead race was finished a; Hya!